Looks don't have to be sacrificed for comfort and this sleek, modern sectional proves it. Upholstered in a soft, weathered espresso, brushed slub knit fabric, the amply cushioned sofa features a rail of bourbon glazed wood tracing the top and sides of its boldly curved back for a welcome contrast in texture and material. 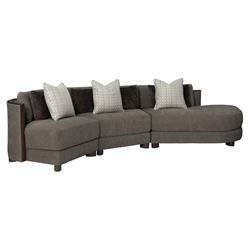 Loose back cushions are paired with throw pillows in a rich, espresso chenille and grey, geometric-patterned sateen, bringing both added comfort and style to the luxurious, contemporary design.